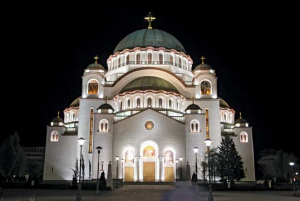 The Orthodox Church, which is also known as the Eastern Church is the second largest Christian church and one of the oldest existing religious institutions in the world. The word Orthodox comes of Greek orthos meaning “straight, correct” and doxa which means “glory.” As the name says, the Church preaches what it believes to be the original Christian religion, with Jesus Christ as is its founder. It is the set of doctrines which were followed by the early Christians. However, there are some other Christian denominations which claim similar beliefs, for example, there are the Anglican Communion, the Assyrian Church, and the Oriental Orthodox Churches. The latter two developed after the Third Ecumenical Council of Ephesus in 431 and the Fourth Ecumenical Council of Chalcedon in 451. In 1054, in the event known as East–West Schism the churches in Rome and Constantinople became finally separated. The West Church became the Roman Catholic Church, while the Eastern Church became the Orthodox Church. The Eastern Orthodox Church is a unity of autocephalous churches, each usually governed by a Holy Synod. It means that all bishops are equal by virtue of their ordination, and there is no structure like in the Roman Catholic Church. Bishops are appointed through the process called Apostolic succession. It means that the first bishops were appointed by Christ´s Apostles, which later appointed other bishops. The religious authority is not a Patriarch or the Pope as in Catholicism, but the Scriptures interpreted by the seven ecumenical councils of the Church. However, the Ecumenical Patriarch of Constantinople is the primus inter pares in Latin meaning first among equals, which means they have the honor of primacy among other self-governing churches. Note: The Orthodox Church handles wedding ceremonies and there are amazing Valentines ideas for her, if you are planning your wedding to be on February 14th. After the Schism, the Church made spread through the Roman and Byzantine Empires and remained the main church on most of those areas even today. It means that majority of Orthodox Christians live in Eastern Europe, Greece, Russia and Caucasus. The oldest existing Orthodox churches can be seen in Jerusalem, Constantinople, Alexandria, Armenia, Georgia, and Ethiopia. However, the Orthodox Church through the history had several critical periods which shaped and formed the Church the way it is now. Those are Byzantine and Ottoman periods as well as a period of keeping the Orthodox Church as the main religion in Russia and the conflict between Eastern Catholics and Eastern Orthodox, the rejection of the Uniatism and finally, Communist Era. It is not a surprise that politics plays the great role in religious doctrines, and Orthodox Church is not an exception. As a result, today we have various autocephalous and autonomous synods of the Orthodox Church which are distinct only regarding administration and local culture. However, two communions reject each other as well as three churches which are not part any communion but which identify themselves as Eastern Orthodox. There are groups which have different opinions concerning the calendar they use, and because of this issue, the Church continued to separate. Some churches use the Revised Julian calendar while others use the original Julian calendar to count all the feasts and celebrations. There are also churches which use the Gregorian calendar for all purposes like the Estonian and Finnish Orthodox churches. Finally, the Orthodox Church is a communion of fourteen administratively independent or autocephalous regional churches, which are defined according to their geographical areas. They are ruled by Council of Bishops or Synod which is lead by the senior bishop. Besides these communions, there is the Orthodox Church in America, which is not recognized as autocephalous by all other communions, but only by the Russian, Bulgarian, Georgian, Polish and the Czech-Slovak Churches.